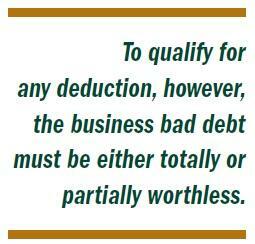 To qualify for any deduction, however, the business bad debt must be either totally or partially worthless (see box below). Here’s the whole story: You must establish that the debt is genuine and that it can’t be recovered from the debtor. Make a reasonable attempt to collect the debt (although you don’t have to use a collection agency or file a lawsuit if you have minimal chance of success). The tax law generally requires you to use a specific charge-off method for bad debts, so you must identify those debts claimed as being partially or completely worthless. If these conditions are met, you can claim the deduction in the year in which the debt became worthless. This includes a previous year for some debts where worthlessness was not immediately apparent. Partially worthless debt: If you failed to claim the bad debt deduction for a receivable that became partially worthless in a prior tax year, you have until the later of three years after filing the tax return (including extensions) or two years from the time you paid the tax to file an amended return and deduct the bad debt. Totally worthless debt: If you failed to claim a deduction for a receivable that became completely worthless in a previous tax year, you have until the later of seven years after the due date of the tax return (not including extensions) or two years from the time you paid the tax to file an amended return and claim a deduction for the worthless receivable. Tip: Cash basis taxpayers can’t deduct bad business debts unless they’ve included the value of the notes in gross income. In a new case, a taxpayer showed the existence of a bona fide debt, but could not prove that it was worthless. Facts: The taxpayer, a mortgage trader in Cali­­for­nia, offered testimony that a note became worthless in 2006. But he had no testimony from a disinterested party or any documentary evidence corroborating the claim. He only testified as to the general business climate in the real estate market. While the debtor’s failure to make interest payments may reflect its inability to re­­pay some portion of its debt, that alone is inconclusive. Bottom line: The Tax Court ruled that the debt was not worthless in the year it was deducted. (Bishop, TC Memo 2013-98).